More than 20 memorials have been built in Cambodian high schools since 2010, in an effort to educate young people about the Khmer Rouge. The aim of the project is to teach about genocide in order to prevent its return. Dy Khamboly, director of the School of Genocide, Conflicts and Human Rights at the Sleuk Rith Institute, told VOA Khmer this week that the project aims to bring Khmer Rouge genocide history to young students, grades 7 to 12, who will grow to be active members of society and can help prevent future genocide. “In understanding our history, we can find solutions to build the nation in the right direction and gain experience from the past,” he said. 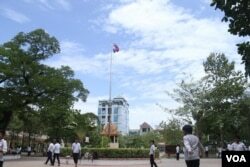 More are planned, including along the Thai border, in some of the final strongholds of the Khmer Rouge, he said. Koy Seda, the school’s principal, said that the project helps students learn from the past so that they will not make the same mistakes. “It is to let the young generation know about how their parents and grandparents during the time, so that they will learn to solve conflict positively and how to forgive someone,” he said, adding that the memorial was established at the school in 2011. “This is good for students my age to learn about people’s lives during the killing fields and to promote reconciliation and to educate students on forgiveness and tolerance,” Khuth Savuth, 19, said. Likewise, Chan Sopheap, who is a civil party for Case 002 at the UN-backed Khmer Rouge tribunal, told VOA Khmer that she wants the next generation to understand the genocidal regime. “When students know, they will remember it and share it with the next generation,” she said.